Alina Miron, co-counsel on the Thai legal team that is presenting the country’s case in the Preah Vihear land dispute before the world court, smiled in surprise when told she had become a celebrity in Thailand. Her strong presentation and photogenic appearance on the court’s TV screens have left many people following the case impressed. Also, many are curious about Miron and how she came to be a member of the Thai team. Thailand’s agent in the case, Virachai Plasai, said that Wednesday’s appearance was Miron’s first before the world court, and that she did a great job of explaining Thailand’s position on the maps Cambodia is using to make its case. “I trust her when it comes to presenting this important topic to the court, and she did an impressive job,” he said. Virachai said he had spent a long time studying the maps with Miron, adding that her knowledge was very helpful. Miron is a Romanian with a solid educational background in public international law at universities in France, including the Universite Paris-Ouest Nanterre la Defense, Universite Paris-Ouest la Defense and Universite des Sciences Sociales. In the world court case, Miron is serving as assistant to the team’s lead counsel, Prof Alain Pellet. She has worked with Pellet on many cases, advocating on behalf of Slovenia, Russia, Greece and Nicaragua. Miron speaks many languages. Romanian is her mother tongue, but she also speaks French and English fluently. Her command of Italian is also good. Thai social media have been gripped by the “Alina Miron fever”. Bloggers, along with Thai senators attending the trial at The Hague in the Netherlands, have praised Miron for her sound reasoning, which they believe will convince the world that Cambodia does not have the right to a 4.6-square-kilometre disputed area near the temple. Appointed Senator Somchai Sawaengkarn posted a message on Facebook praising Miron’s politeness and her technique of reasoning. He said her use of pictures and maps to make comparisons have made Thailand confident of winning the case. “[Another senator] could not help but compliment her, telling her in person that she was ‘excellent’,” Somchai said. Senator Kamnoon Sithisamarn said Miron demolished Cambodia’s argument, which is based on the Annex I map, dismissing it and turning the courtroom’s attention to maps introduced by Thailand in the 1962 case. A blogger called “Sai Trong Paksanam” said Miron pointed out credible and technical problems with Cambodia’s Annex I map, saying it has been altered and contradicted geographically. Miron said the Thai team has found there are six different versions of the Annex I map. The blogger received 5,000 “likes” and 2,310 “shares” 22 hours after posting. Sermsuk Kasitipradit, a Thai PBS reporter, posted pictures of Miron and a message on his Facebook page and received 700 “likes”. “Miron fever” also gripped the Pantip website, thanks to blogger “BaaD” with his blog “Netizens praise Miron after her taking to pieces Cambodia’s Annex I map”. A dairy producer from Covasna County will roll out this year a whey-based energy drink that is especially recommended to athletes and highly active people. Company manager Zoltan Bako told AGERPRES that this is a one hundred percent natural product obtained in co-work with the ICECHIM National Research Institute in Bucharest. “Whey has a highly valuable nutritional composition. When they speak about whey people generally think of a milk sub-product commonly used in animal husbandry, in livestock breeding. (…) We thought of using this product for human consumption, and thus developed a cooperation with the ICECHIM National Research Institute of Bucharest. It is a natural, refreshing drink for anyone, but we thought of athletes in the first place, because it contains a lot of minerals. (…) Such drinks are already on sale in foreign countries like Switzerland and Sweden, we target the domestic market. We still need to invest in equipment, to be able to produce on an industrial scale, and we hope to roll out the product this year,” said manager of Meotis company, Zoltan Bako. Doctors confirm that whey contains certain proteins which, once they reach into the body, destroy tumors, enhance immunity, lower cholesterol, combat stress and have an overall invigorating effect. ”One of its benefits is that it is low in calories, it boosts immunity and is also recommended for persons suffering from diabetes, who must observe a specific diet. Of course, patients suffering from certain diseases who want to follow a whey therapy must first consult with the physicians,” said doctor Ildiko Halmagyi, a specialist in diabetes, nutrition and metabolic diseases from the city of Sfantu Gheorghe. Whey contains vitamin B, calcium, iodine and potassium, which are all substances that render the skin smooth and the hair shining, therefore it is also recommended for cosmetic treatments, as well as in weight loss diets. The elders too say that whey helps combat many diseases, including gout, cancer tumors, diseases of the bones, lungs, liver and heart. It’s also very good for people suffering from anemia, who must drink a glass of 300 milliliters a day. “They say that goat milk and whey can heal 17 diseases. (…) Townspeople came here, asking me to give them whey to drink and they followed this therapy for a year long. That’s what they say, that sheep and goat whey is very good,” says Veta Hosu, a village woman from Ciumernic — Covasna County, who has farmed sheep and goats for decades. Guest houses, motels and hotels of the alpine spas in northern Romania’s Maramures are fully booked for the New Year’s night and the other three days to come of the winter holiday. “Tourists, most of them Romanians, alongside foreigners too have chosen to spend the night between years either in the half-board houses in the Maramures County’s villages and communes, or in the motels and hotels of the five spas of the county. For those who preferred the New Year’s night in the countryside, traditional meals are waiting for them, of which the pork meals will keep the top: cabbage rolls (sarmale), jellied pork, white and black pudding, smoked bacon, next to Transylvanian specific meals. The traditional sponge cake and the stone baked, the wine and the mulled plum brandy from their own household too will complete the meals seasoned with some other culinary goodies in order to diversify the food on this special night,” the chairman of the National Agency of Cultural and Ecological Rural Tourism (ANTREC) Maramures, Victoria Berbecaru told Agerpres. The tourists who are going to spend the New Year in the country will be carolled, and bands of folk music will delight their ears with recitals courtesy to some board houses’ owners. “We are pleased that all guest houses and motels in the Borsa mountain spa are fully booked this year. It’s a sign that one could make performing tourism when having good road infrastructure,” said, in his turn, the Maramures County Council’s deputy-chairman, Gabriel Zetea. Tourists who have chosen as destination the Vaserului Valley will enjoy an outdoors’ New Year’s night in the Maramuresului Mts., after strolling with the Mocanita narrow gauge train more than 21 km till the Novat-Paltin terminus station, where the train’s owners have completed preparations for a nature party. “At end-journey, in the Novat-Paltin station tourists will descend and will be expected to spend their New Year’s night in open air at camp fire. All comfort conditions were created for such an event. The meals are traditional, and completed with hot wine and the customary Maramures mulled plum brandy, next to champagne. The charm of the night between years spent in the strong mountain air is something special and we are happy that the foreign tourists choose to spend the end of the year in such a landscape,” said Ioan Coma, the manager of the Viseul de Sus Forest Railway which administers the Mocanita train. The price for the most important night of the year in a rural board house in Maramures County varies from 150 RON to 250 RON, and a day of full accommodation, B&B, could make it to 70-120 RON. Romanian Malina Calugareanu climbed to the top spot of the World Cup of Junior Women’s Foil thanks to the good showing in the legs hosted by Timisoara (1st place), Guatemala (1), Bochum (37) and Bratislava (9), the Romanian Fencing Federation announced on Thursday. Calugareanu, with CSA Steaua club, is ranked No 1 in the to-date rankings of the 2014/2015 World Foil Cup season with 100 points. Ranking 5th is Romanian Maria Boldor, while Ana Boldor takes the 42nd spot. Romanian Boxer Cristian Ciocan has defeated, through a decision by the judges, Brazilian fighter Irineu Beato Costa Junior, on Friday evening, in a match running its full course of 12 rounds, taking place as part of a professional gala in Cuxhaven (Germany). Christian Hammer (27 years old), as the fighter from Galati is known in Germany, received the unanimous decision after a match he controlled in an authoritarian manner, also managing to knock down his opponent in the final round. Ciocan, European WBO champion in the heavyweight category, had, up to now, only disputed matches lasting a maximum of 10 rounds, ending three 12-round bouts before the limit was reached. Romania has obtained a silver medal, through pair Mihai Paraschiv – Diandra Illes, in the Ten Dance Youth and Adults World Championships that took place on Friday in Riga, Latvia, according to a press release remitted by the Romanian Dancesport Federation. Romania was represented in the youth section by pair Mihai Paraschiv — Diandra Illes, part of the Authentic Dance Sport 2007 Bacau club, their coach being Valentin Illes. First place was taken by Russian pair Sergey Rojkov — Veronika Dicika while the bronze medal was taken by Polish dancers Mateusz Brzozowski — Justyna Mozdzonek. In the Adults category, Romania was represented by brothers Bogdan and Maria Talpiga, part of the Phoenix club in Bucharest, where they are coached by Gheorghe Raduca. The Talpiga brothers have taken 19th place in the Latvian capital. The competition saw the participation of the national champions of each country, the event hosting 30 pairs from 30 countries in the youth section and 33 pairs from 33 countries in the adults section, the Romanian Dancesport Federation informs. The Brukenthal National Museum is the oldest in Central and Eastern Europe, first open to the public in 1817, a phenomenon museum that has opened its gates so that the public could admire its collections in all their glory. ‘We want to draw attention, starting this year, that in 2017 we will celebrate Baron Brukenthal as well as 200 years of the museum’s activity. The Brukenthal Museum was born as a collector’s museum that was donated to the community. This is how we prepare for 2017, with a museum that addresses the community, a museum that follows the things around it. After 2017, 2021 will come when we celebrate the 300th birth anniversary of Brukenthal , when we return to a classical museum. This is a dialogue with the community, with visitors and with the world. Cultural heritages cross boundaries, continents and time. (…) I begin to feel good at Brukenthal as worlds are congregating,’ says Sabin Luca, director of the Brukenthal National Museum. Baron Samuel von Brukenthal (1721-1803) was the only representative of the Transylvanian Saxon community to whom major public offices in the Austrian Empire were entrusted under Empress Maria Theresa, with the first such office having been aulic councillor of Transylvania. His time spent in Vienna in this capacity coincided with the formation of his collection of paintings, which was mentioned in 1773 in ‘Almanach de Vienne’ as one of the most valuable private collections that could be seen in the Viennese cultural circles of the time. Initial collections of Baron von Brukenthal, consisting of an art gallery, a print room, a library and a numismatic collection were created between 1759 and 1774. Appointed Governor of the Grand Principality of Transylvania, a position he held between 1777 and 1787, Samuel von Brukenthal built in Sibiu a late Baroque palace, modelled on Viennese palaces. Brukenthal Palace is one of the most important Baroque monuments in Romania. It was built in stages between 1778 and 1788. The appearance of the palace seen from the Market Square is particularly elegant because of the verticality of its pilasters and attic ceiling. The palace was built to serve as the official residence of the baron and as the main storage place for its collections. Currently, Brukenthal Palace houses the European Art Gallery of the Brukenthal National Museum and the Brukenthal Library. Far from the eyes of most of the visitors, in the courtyard of Brukenthal Palace, is the library. It contains tens of thousands of works published in the 16th, 17th and 18th centuries, including works by Moliere published in Paris in 1734 in six volumes, Boccaccio’s ‘Decameron’ printed in London in 1757, ‘Harmonia Macrocosmica,’ a typographic jewel with 27 colour maps, and ‘Quatre livres’ by Albert Durer, published in Paris in 1557. The most valuable item in the library is, the ‘Brukenthal Breviary’ or ‘Book of Hours,’ which manuscript is an exceptional work of the Flemish school of miniatures dating from the first decades of the 16th century. Of the 422 incunabula in the library worth mentioning is Hartman Schedel’s ‘Liber Chronicarum,’ the Nuremberg Chronicle published by the famous Nuremberg printer Anton Koberger in 1493 that has over 600 illustrations. Also in the library there is a Bible published by the same printer in Nuremberg in 1483. The Brukenthal Library also has a collection of old Romanian books, including Varlaam’s ‘Cazania,’ a religious book of sermons and stories explaining the meanings of evangelical texts, printed in Iasi in 1643. Its collection of books printed in Transylvania or about Transylvania is special. The oldest book on display is work is ‘Augustinus Haereseon Catalogus,’ printed in Brasov in 1539 by Johannes Honterus the first printer in Transylvania. Brukenthal Palace in the Market Square and the baron’s collections together make up the core of today’s Brukenthal National Museum, which gates have been open to the public ever since its inception by its founder’s testamentary disposition. Currently, the Brukenthal National Museum operates as a public institution of mixed ownership, under an agreement between the Romanian Government and the Evangelical Church of Sibiu. Visiting the museum is not confined to a single building or a single profile of specialisation, becoming a comprehensive journey that presents multiple aspects of the past and the ever changing present, reflected in a wide variety of exhibits covering approximately 10,000 square metres, of which 5,500 are new and recently refurbished exhibition spaces. Initially showcasing the collection of European paintings of Baron Samuel von Brukenthal in one building, the museum today houses a wide variety of valuable collections in 9 buildings, of which 5 are palaces built in different eras: the earliest building, which foundation dates back to the 13th century, is part of an architectural compound that also includes a Museum of History, while the most recent dates back to 1901, now hosting the Contemporary Art Gallery. In 2006-2009, the museum underwent a spectacular transformation, with all its buildings having been refurbished and 85% of its exhibitions redesigned and extended in accordance with methodologies and concepts of contemporary museology. The Brukenthal National Museum’s main priority in its programmes and projects for the future is capitalising on its heritage at a European level through international exhibitions. The programme started with the ‘Bruegel, Memling, Van Eyck — The Brukenthal Collection’ exhibition opened in 2009 at the Jacquemart-Andre Museum of Paris and continued with exchanges of exhibitions conducted in cooperation with museums in Poland, Germany, Italy etc. and the development of educational programmes. The Brukenthal National Museum was chosen by the European Commission and Europa Nostra among the winners of the 2010 edition of the European Union Prize for Cultural Heritage / Europa Nostra Awards (Category 4 — Education, Training and Awareness Raising). It was the first museum in Romania to receive a prize from the European Union. In 2011, the Brukenthal National Museum was included in The Best in Heritage Excellence Club by the European Heritage Association. The Brukenthal National Museum has conducted sustained branding. Depicting the portrait of Baron Samuel von Brukenthal, the brand was launched with the release of the Brukenthal Chocolate (2008). It has been promoted alongside the façade of the palace and the logo of the institution in a series of increasingly wider range of branded and customised products. In 2012, it was awarded ‘The Most Promising Romanian Cultural Brand’ prize. In May 2013, the Brukenthal National Museum started a campaign called ‘I love Brukenthal’, proposing a return to acknowledging the individual action of cultural patronage, aimed, via the museum, at the local, national and European community, of which it is a part, by the magnitude of the projects it conducts. German and Austrian paintings are perhaps the highest in demand at Brukenthal Palace. The richest European painting collections of the Brukenthal art gallery is the German and Austrian collection, counting nearly 500 paintings from the 15th to the 18th centuries. Yet, most of the works are from the 17th and 18th centuries illustrating various trends of the Baroque, including the influences of the Flemish, Dutch and Italian schools. The Brukenthal National Museum is the only museum in Romania that has in its collection of European paintings works by Jan van Eyck, Hans Memling and Titian Vecellio Da Cadore, which can be seen on display along with works by other masters such as Antonello da Messina, Lorenzo Lotto, Pieter Bruegel the Elder, Pieter Bruegel the Younger, Jacob Jordaens, David Teniers II, Philips Wouwerman, Philips de Koninck, Frans van Mieris I, Alessandro Magnasco and Rosalba Carriera. An integrant part of the Brukenthal art gallery, the collection of Flemish and Dutch paintings comprises approximately 450 works. The most famous temporary exhibition now at Brukenthal Palace is the first exhibition in Romania of famous Salvador Dali’s illustrations for Dante’s ‘Divine Comedy,’ basically the main graphics work of the Spanish painter, an artist who believed to be akin to Romanians and who wanted to come to Romania, according to exhibition curator Maria Ordeanu. The Brukenthal National Museum means Brukenthal Palace, the neighbouring Blue House where there are the Romanian Art Gallery, the Gallery of Contemporary Arts, the Museum of History, the Museum of Natural History, the Museum of the History of Pharmacy, the oldest of its kind in Romania, the Museum of Hunting and refurbishment workshops. Daily Mail: Romanian girl start to created “Invisible man”. Researchers have found a way to make see-through mice, but you won’t find these critters scampering in your kitchen. The transparent rodents aren’t alive and they’re for research only, to help scientists study fine details of anatomy. 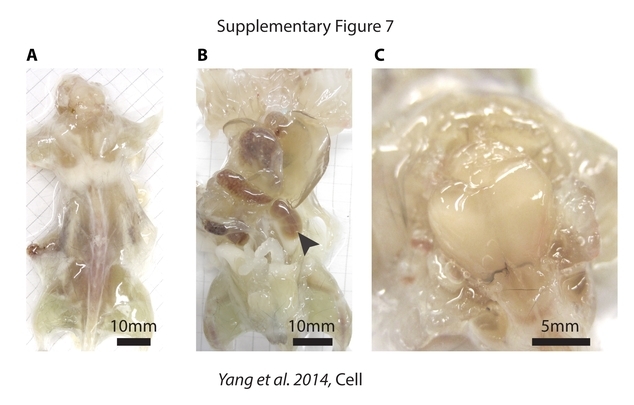 Researchers made their inner organs transparent, but not their bones. 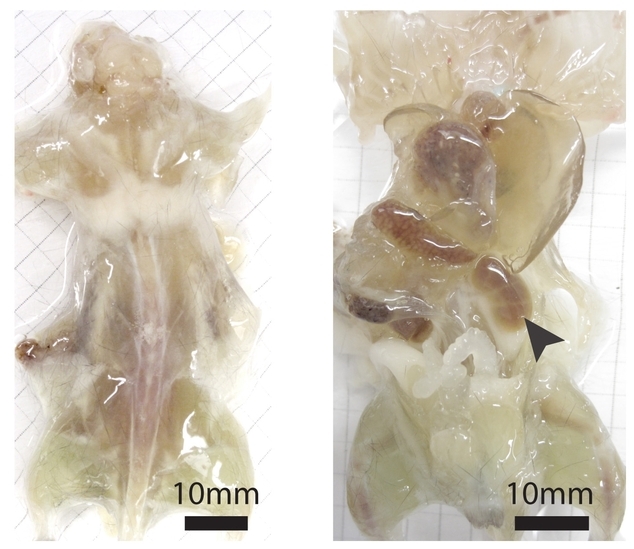 A mouse with its skin removed during various stages of examination. The center image shows the mouse after one week of the process. The image at right shows the latter stage, showing the brain of the mouse with it’s skull removed. 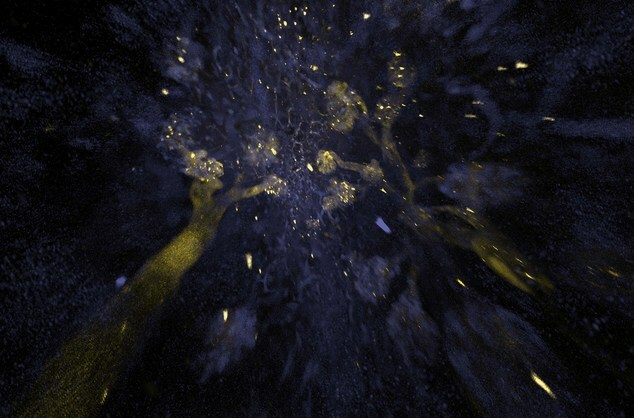 This image provided by the journal Cell shows a 3-D visualization of fluorescently-labeled kidney cells within an intact kidney tissue in a rodent. 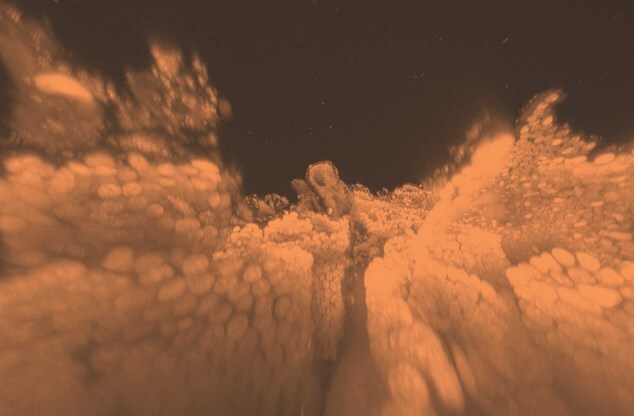 The see-through technique involves pumping a series of chemicals through blood vessels, as well as other passages in the brain and spinal cord. Some chemicals form a mesh to hold tissue in place. Others wash out the fats that make tissue block light. It takes about a week to create a transparent mouse, Gradinaru said. The researchers have also made transparent rats, which take about two weeks, she said. ‘Although the idea of tissue clearing has been around for a century, to our knowledge, this is the first study to perform whole-body clearing, as opposed to first extracting and then clearing organs outside the adult body,’ said Vivian Gradinaru of the California Institute of Technology, who led the research. Before they are treated with chemicals, the animals are euthanised and their skin removed. The result looks like a rodent-shaped block of gelatin with the organs held in place by connective tissue and a gel used in the procedure. Mice are mainstays of biomedical research because much of their basic biology is similar to ours and they can be altered in ways that simulate human diseases. Scientists have been able to make tissues transparent to some degree for a century, and in recent years several new methods have been developed. Last year, for example, a technique that produced see-through mouse brains made headlines. The left image shows the mouse with the skin removed. The right image shows the mouse after one week of the process. Such treatments reveal far more detail than X-rays or MRI exams could deliver. The new work is the first to make an entire transparent mouse, experts said. 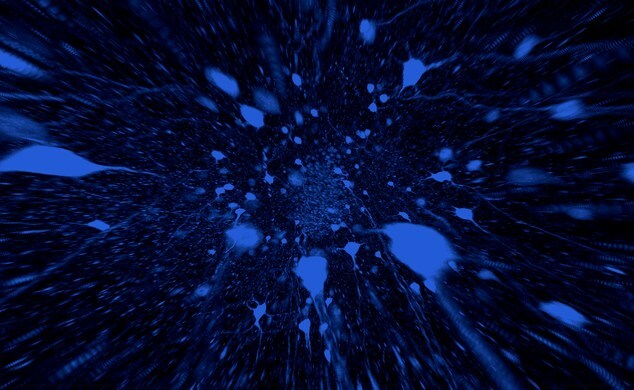 It should be useful for projects like mapping the details of the nervous system or the spread of cancer within lab animals, said Dr Gradinaru, senior author of a paper describing the work in the journal Cell. This image shows a 3-D visualization of fluorescently-labeled intestine cells within an intact intestine tissue of a rodent. It might also help doctors analyse biopsy samples from people someday, she said. The see-through technique involves pumping a series of chemicals through blood vessels, as well as other passages in the brain and spinal cord. Some chemicals form a mesh to hold tissue in place. Scientists can use stains to highlight anatomical details like the locations of active genes. The author of a great number of works – ballets, quartets, songs, lyrical songs, music for stage plays and more than 200 films, music for opening and closing ceremony of the 1980 Olympic Games held in Moscow. The multiple award-winning academician of 8 Academies. The famous waltz from the motion-picture “A Hunting Accident” is one of the most famous music works of the 20th century. In accordance with a special decision of UNESCO, the waltz is recognized as one of the 4 musical masterpieces of the last century. His song “My White City” is the official anthem of Chisinau, the capital of Moldova.